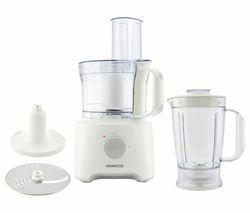 A great addition to any kitchen, a Kenwood food processor will allow you to add a new and exciting dimension to meal times. The perfect fit for any cooking environment, a Kenwood processor is ideal for chopping, liquidising, slicing, grating or even kneading your favourite ingredients. This will not only save you a significant amount of time and energy when it comes to preparing your favourite meals, but it will also allow you to put your cooking skills to the test when it comes to experimenting with different recipes. 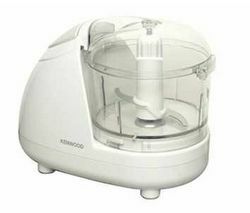 Within our high performance product range you will find a whole host of Kenwood food processers including the Kenwood FPM260 Multipro Food Processor – Silver, the Kenwood MultiPro Compact FDP301WH Food Processor – White, the Kenwood CH180 Mini Chopper – White and the Kenwood FGP200WG Spiralizer - White & Green. All of the models featured within our Kenwood food processors range have been manufactured to the highest possible standard, allowing even the most novice cooks to enjoy exceptional performance, versatility and functionality. Offering variable speed settings, an array of accessories, as well as space saving designs which means you won’t have to worry about your new Kenwood food processor imposing on the look and feel of your kitchen, our food processors really will make meal times a breeze! Many of the models within this product range also come complete with a chopping blade, slicing and grating discs, as well as detachable parts, which can be put in the dishwasher, once you have finished using them. And we don’t just stock Kenwood food processors, we also offer a number of other food processing options from some of the industry’s leading brands including kitchenaid food processors. And if you are looking for a portable food processing solution that you can pack up and take anywhere with you, make sure you check out our mini food choppers.